Jonathan & Amy: Phillies Game! Lockheed had a Family Day thingy for a Phillies game, and it was a lot of fun. 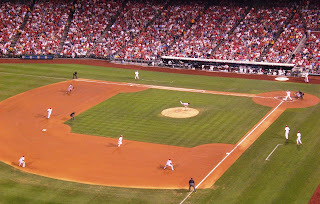 The opponent was the Arizona Diamondbacks, which is a team I had previously never watched. We got to the parking lot a little after 4pm, as there was a 3-hour tailgate before the first pitch at 7:05pm. We carpooled with Andrew, who was driving a Chevy Equinox that week and had a tailgate of sorts. We parked back-to-back with Ryan, who was rocking out the back of his Corvette. There was a ton of food and plenty of waters, Monster drinks, and sodas. There were hamburgers, hot dogs, chicken sandwiches, sausages and peppers, caesar salad, and a penne pasta dish. There could have been more side items, but everything was good. I tried the pasta and had a chicken sandwich (with cheese, bbq, and pickles), and was happy with both of my selections. Jonathan tried the burger and the chicken sandwich, and enjoyed both as well. It was sweltering out, and it was a rough few hours waiting for something more exciting to happen. We registered for a chance to win some Eagles tickets, but otherwise just entertained ourselves listening to music and chatting with others walking by. We headed for the stadium with throngs of others, and were greeted with "My First Phillies Game" certificates. Our seats were really up in the nosebleed section, and we were remarkably close to the foul line pole at third base. The stadium was absolutely packed, with 45,712 in attendance. I have never been to a game that full before, but it did seem like there were several organizations present. It was Jewish Heritage Night, and a few Universities seemed to have delegations there as well. 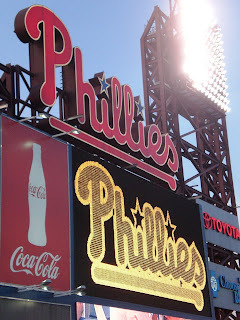 The game was pretty exciting, as the Phillies scored 12 runs, including three homeruns. 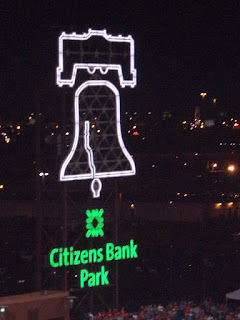 It's neat that they light up this giant Liberty Bell and move it to "ring" when a homerun is hit (video at the bottom of this post). There were also at least two broken bats, possibly three (those always fascinate me!). For all of the Jewish people in the audience, they had a bottle dance before the first pitch, a group of children do a ring dance of sorts at one point, and "Take Me Out to the Ballgame" was sung in pre-recorded Yiddish. Definitely not your ordinary game! Still, the Phillies are a good team, and the crowd seems to adore the team and cheer for favorites, so it was fun getting into it. Hopefully this is a great omen toward all of the professional sports in the area (Eagles and Flyers in particular!). We left at the top of the 8th to avoid the traffic (it was a blowout anyway). We found a secret route back to I-95 and were able to bypass a lot of traffic.